Students attending President David Leebron’s office hours on Friday raised issues ranging from new study programs to undocumented student advocacy. Once a semester, President Leebron opens his door to allow Rice students to sit down and speak with him about any topic on their minds. For Leebron, his office hours are a chance to engage with students on a more direct level. While Leebron asked that the conversations at his office hours be off the record to maintain open conversations with students, the Thresher spoke to several students who attended and followed up with Leebron afterward. Audrey Cabay, an international student from Singapore, spoke about her concerns regarding both diversifying the body of international students and integrating them socially and academically once they matriculate. Leebron said the Vision for the Second Century II document, which will establish a strategic plan for the university’s next five to 10 years, will address increasing the diversity of Rice’s international population. The main issues, Leebron said, are financial aid and the qualifications of students, primarily their English proficiency and analytical skills compared to the rest of Rice’s student body. Cabay said she was satisfied with her conversation but disagreed with the latter part of his assessment. Leebron said social integration of international students could be taken up by colleges and the SA, an assessment with which Cabay concurred. Engles, the Lovett senator, asked the president about the existence of any immediate plans regarding undocumented student advocacy beyond Rice. Leebron said that, in order to better represent all of Rice, he does not express his political opinions often and chooses carefully issues to take a stand on that directly relate to Rice’s community. Engles asked Leebron what he would do for members of Rice’s staff whose Temporary Protected Status may not be in effect any more. Leebron said that he would check with Human Resources. Engles also asked Leebron about Rice’s annual tuition increase in contrast to the four-year fixed tuition implemented by other schools in Texas, including Texas A&M University and the University of Texas, Austin. Prior the 2009-20 academic year, Rice charged different tuition rates for each matriculating class. Leebron said that consistency of tuition increases give students a reasonable expectation of what they will be paying in coming years. Financial aid packages also adjust for tuition increases, according to Leebron. He said that there is a trade-off between the amount of tuition charged and how much the school can do, and that many extraneous fees and external cost increases are encompassed by the tuition increases. Engles said she accepted Leebron’s explanation as to why a flat tuition would not work, but said that Rice’s administration should be more transparent about annual tuition increases with admitted students. Engles also brought up the possibility of an academic crisis management program. According to Engles, the skills that would be taught by such a program are especially relevant after Hurricane Harvey and this year’s snowstorms and are universally applicable. “Crises arise constantly, and for our university to offer some sort of certificate program or minor [would] help students develop leadership skills [and] administrative skills, and gain the ability to be calm during a stressful situation,” Engles said. After musing that perhaps he should teach such a class, Leebron said that he had also thought about having a small number of student interns, who could learn from how he and others in the administration manage crises. Daniel Wang, Hanszen College sophomore, said he was a returning attendee of Leebron’s office hours. He came on Friday to ask Leebron about the possibility of a global health major. “I went last semester and we had a pretty interesting chat, so I thought I’d go again — it’s not every day that you get to hear from President Leebron, unless you follow his Twitter,” said Wang. In response to Wang’s inquiry, Leebron said that with the number of pre-med students at Rice, the enrollment and resulting cost of such a program would likely be large. “Both the administration and faculty would have to make sure the program was sustainable, and determine what the financial needs might be,” Leebron said. Leebron also said that global health is a possible priority of the V2C2 plan and potential area for which additional funding will be sought. After a slight pause in conversation, Wang asked if Leebron had recommendations for good tourist spots and restaurants in New York City, where Leebron used to live. “I wanted to get past the air of official-ness and was curious to get a glimpse of who Leebron is — snippets of himself outside of just being Rice’s president,” Wang said. The president suggested the World Trade Tower Memorial, cloisters of the Metropolitan Museum of Art and the Highline as places to visit, and divulged some of his favorite places to eat. Derek Brown, who plays for Rice’s football team, came to Leebron’s office hours to discuss problems in administration of athletic stipends. 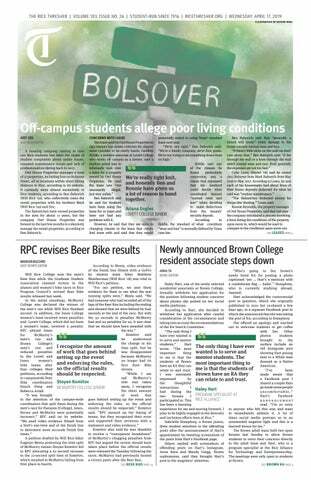 “I matriculated at Rice in 2012 and since then every semester has been different in terms of how we receive our payments,” Brown, a Baker College senior, said. According to Brown, the inconsistent timing of payments, which often come too early or late, has created financial planning and budgeting difficulties for student-athletes, especially for those living off campus who must pay for rent and utilities each month. Leebron said that while he had not known of the issue, he would follow up with responsible administrators if Brown would send him an email after with more details. He also expressed his concern about the number of student-athletes who choose to live off campus, saying that V2C2 will address the issue of additional housing. Brown said he respected the president’s response but had wished for more attention to his particular issue. “I [hoped] President Leebron would have asked more questions of clarification and spent more time addressing this issue in comparison to his time addressing matters such as dinner reservations and tourist ideas in New York,” Brown said. Alberto Tohme and Michael McDowell, who have recently started a mock trial club at Rice, said they came to ask Leebron for advice and contacts. “I thought it was good idea to bring up mock trial to Leebron because, as a lawyer by trade, Leebron might be able to connect us with legal professionals in Houston,” Tohme, a Baker junior, said. Leebron responded by asking Tohme and McDowell to send him an email with more details, after which he would follow up. “We could not be more pleased about his response. He demonstrated that he cares about the team,” McDowell, a Wiess College sophomore, said. Leebron said he enjoys this interactive aspect of his job as Rice’s president.